In a typical ICU, a dozen different streams of medical data light up the monitors at a patient's bedside – including heart physiology, respiration, brain waves and blood pressure. 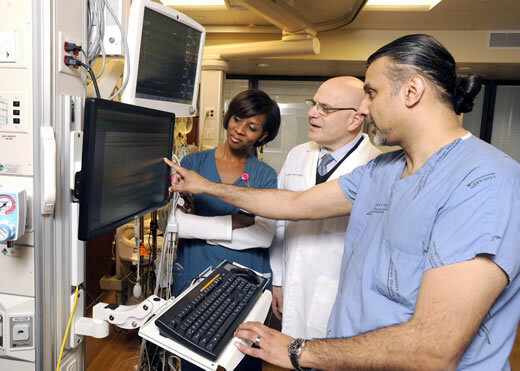 Emory University Hospital is using software from IBM and Excel Medical Electronics (EME) for a pioneering collaboration to create advanced, predictive medical care for critical patients through real-time streaming analytics. Emory is testing a new system that can identify patterns in physiological data and instantly alert clinicians to danger signs in patients. In a typical ICU, a dozen different streams of medical data light up the monitors at a patient's bedside – including heart physiology, respiration, brain waves and blood pressure. This constant feed of vital signs is transmitted as waves and numbers and routinely displayed on computer screens at every bedside. Currently, it's up to doctors and nurses to rapidly process and analyze all this information in order to make medical decisions. The new system that Emory is exploring will enable clinicians to acquire, analyze and correlate medical data at a volume and velocity that was never before possible. The research application developed by Emory uses IBM's streaming analytics platform with EME's bedside monitor data aggregation application to collect and analyze more than 100,000 real-time data points per patient per second. The software developed by Emory identifies patterns that could indicate serious complications like sepsis, heart failure or pneumonia, aiming to provide real-time medical insights to clinicians. "Accessing and drawing insights from real-time data can mean life and death for a patient," says Tim Buchman, MD, PhD, director of critical care at Emory University Hospital. "Through this new system we will be able to analyze thousands of streaming data points and act on those insights to make better decisions about which patient needs our immediate attention and how to treat that patient. It's making us much smarter in our approach to critical care." Advancing the "ICU of the Future"
A variety of industries have adopted information technology innovations to transform everything from weather forecasting to predicting the outcomes of presidential elections. Emory's vision of the "ICU of the Future" is based on the notion that the same predictive capabilities possible in banking, air travel, online commerce, oil and gas exploration and other industries can also apply in medicine. The system being piloted at Emory uses EME's BedMasterEX, IBM InfoSphere Streams and Emory's analytics to collect and analyze physiological patient data in real time. For example, patients with a common heart disorder called atrial fibrillation (A-fib) often show no symptoms, but it is a common and serious condition that can be associated with congestive heart failure and strokes. Using the new research system, Emory clinicians can view a real-time digital visualization of the patient's analyzed heart rhythm and spot A-fib in its earliest stages. Currently in the research phase, streaming analytics could one day be common practice across ICUs and other medical settings worldwide. "As the medical community increasingly embraces the power of technology to help improve health outcomes for patients, predictive medicine is finally becoming reality," says Martin S. Kohn, MD, chief medical scientist at IBM. "The ability to pull actionable insights from patient monitors in real-time is truly going to transform the way doctors take care of their sickest patients."